For years I have been trying to dodge the label “Croatian writer” or “Croatian writer who lives in Amsterdam,” though my life experience has confirmed that this sort of tattoo is almost impossible to remove. Why? Because most people use ethnic coordinates when remembering, classifying, defining, and judging others. … in Croatia (like, indeed, so many other places), male writers represent their homeland, state, nation, and national literature; their works harmoniously build the national literary canon. Female writers may either profit by or be victimized by such constellations. Mostly they are victimized. Other highlights from this issue include a feature on Gulf Literature, here represented by several authors from Mexico, the US South, and Cuba. A powerful excerpt from LeAnne Howe’s “Savage Conversations” tells the story of Mary Todd Lincoln being judged insane because she was haunted by an Indian. “And I believe her,” Howe begins. A powerful way to contextualize her work as feminist and post-colonial. The rest of the piece is crazy and brilliant. 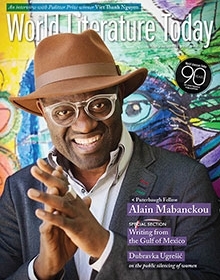 The interview with Alain Mabanckou does a great job of introducing this writer by his reading list. I love his project of actively trying to read–and to be influenced by–lit from around the world. He wants to cover all continents, it seems. This is worth skimming for his reading list alone. Some of the African writers he names are Aimé Césaire, Édouard Glissant, René Maran, Mongo Beti, Camara Laye. In the marvelous World Literature in Review section, a brief mention of a recently translated Natalia Gromova’s Moscow in the 1930 (Trans. Christopher Culver). Go ahead and buy this book. For all interested in twentieth century Russian lit, this is required reading.